Hey there! eSports is a thing, people! More and more is being shown on national television and more and more gamers are honing their skills to be the best! What better way than to step into that world and see what's it's all about than by heading over to XLIVE 2016 in Las Vegas this December! Need additional details? Check out the official press release below! XLIVE - Las Vegas, NV - The vast, veritably uncharted territory of eSports is set to take center stage at XLIVE 2016, the world-renowned preeminent conference & expo focused on festivals and live events taking place in Las Vegas this December 5-7. As this rising niche business of gaming gains exposure in the mainstream global market, XLIVE offers eSports enthusiasts critical solutions for current issues and looks ahead to future industry trends. Further translating the role of eSports within the live event industry by examining methodologies to continue expansion, XLIVE dives deep into the world of gaming and beyond. Catapulting eSports to the forefront of live events, XLIVE has curated an educational roster of speakers who will deliver insightful talks on a variety of subjects facing an industry poised to make a lasting imprint on the mainstream festival society. This year, XLIVE will touch upon all facets of the market, from the evolution of eSports to making the most of its strong, underground fanship following. Those in attendance at the conference who are interested in learning more about building an enterprise and top level strategies surrounding eSports will have access to invaluable expertise on these topics, and more! 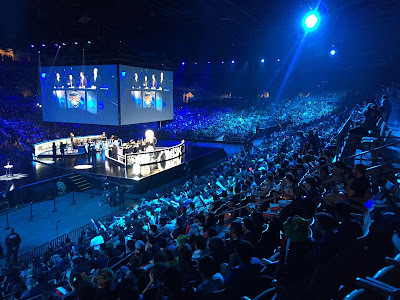 From the first inkling of the existence of gamers network many years ago to the rising popularity of live viewership arenas that continue to serve fans of professional gamer competitions today, the realm of eSports has grown tenfold and XLIVE is excited to help expand this growth into the live event market. XLIVE 2016 will host CMO of Delaware North, Todd Merry to illuminate eager “students” on how the landscape will continue to change over the next 25 years through his speaker presentation “The eSports Explosion”.Global Head of eSports + WME/IMG, Tobias Sherman, and CEO of Spylce, Marty Strenczewilk, will also provide their expertise correlating in a speaker review “Must See TV”, tapping into “Why eSports Are The Next Media Content Gold Rush.” Taking into consideration the rapid rise in ratings for live sports, eSports has become the new, most cost-effective source of entertainment to draw Millennial and Generation Z audiences. The “Must See TV” panel will further explore these topics plus how broadcasters and content publishers are building marketing and monetization strategies around relevant coverage. XLIVE 2016 will also focus on the Las Vegas economy and how it relates to eSports exploring ways in which local residents and eSports event producers alike can benefit from this booming rise in professional gaming. Led by Seth Schorr, Chairman of Downtown Grand Hotel & Casino Las Vegas and Alex Igelman, Managing Director of Gaming Research Partners, the XLIVE 2016 panel “Game On” - How the Downtown Grand Became the Hub for the Las Vegas eSports Scene, will enlighten audiences on how the Downtown Grand Hotel became a pioneer in eSports world as the inaugural casino operator in Las Vegas to open an on-site eSports lounge while also applying to become the first casino in America to offer betting on a live eSports tournament. Traversing the new frontier of eSports, XLIVE will continue to touch on a wide expanse of topics, which will enable gaming tournament producers to create world class in-venue experience for fans of eSports, take an investigative look at elite cyber-athletes and their rise in demand, plus activate current producers and ambitious entrepreneurs alike on tapping into the very best resources to propel eSports to the top of the live event spectrum. So are you guys going or what?! I'm definitely going to try to be there to cover the event. Are any of you guys going to attend? Let me know and we'll meet up! See you there!!! Later!! !